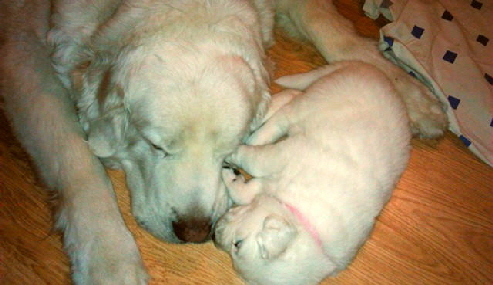 In February, 2011, Joyce spent a long weekend visiting the Matwijewicz family , Buschwinkel Kennel, and 11 Tatra puppies. 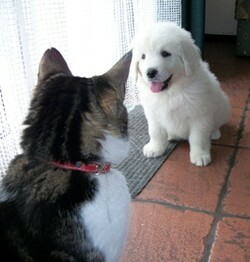 Click on the picture of a puppy and the cat, Mr. Johnson, to see a video of this experience. 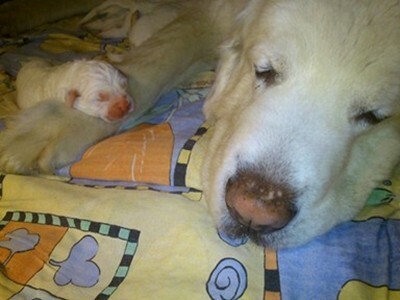 On December 26, 2012, Kama delivered her third litter, this time, of 10 puppies. Again, Joyce visited our friends in Poland at about the time when the puppies were weaned, and that they were being released to their new homes. This time, she was pressed into service as a translator, as several of the puppies went to English-speaking homes, including one that now lives in Virginia. Click on the picture of Kama and the infant puppy to see a video of these puppies and Joyce’s visit with them in February, 2013. 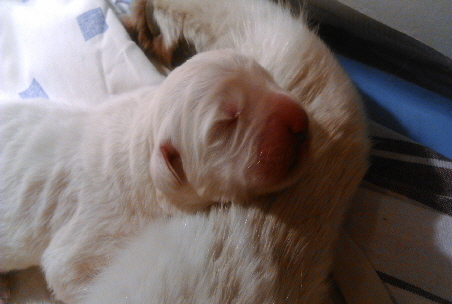 Late in December, 2010, Kama, the Polish Tatra Mountain Sheepdog of our Polish friend, Beata Matwijewicz, had a litter of puppies. 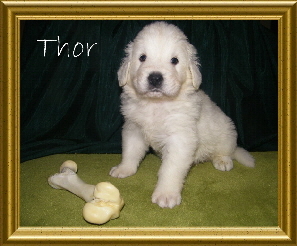 Click on Thor’s picture to see a video of these puppies. 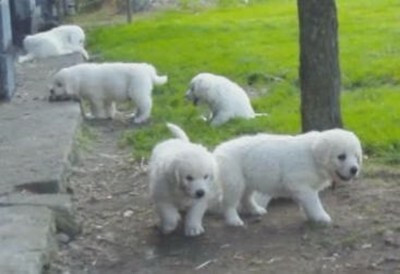 In August, 2011, Buschwinkel Kennel received their second liter of Polish Tatra Mountain Sheepdog puppies. Click on the picture of 2 pretty girls with the puppies to see a video of these puppies and our visit with them. On July 5, 2013, Kama delivered yet another litter of 11 puppies. In August, we made the trip to Poland to spend some time with these puppies. Interestingly, this litter was conceived on the day that their father, Dunaj, returned from the show where he was declared a Tatra stud dog. Click on the 5 puppies to see a movie from this puppy visit. On January 3, 2014, Kama delivered her fifth litter of puppies. There were a total of 6 puppies, 3 males and 3 females. Joyce had planned to visit these puppies in February, but she was disappointed by having her flight canceled because of bad weather. 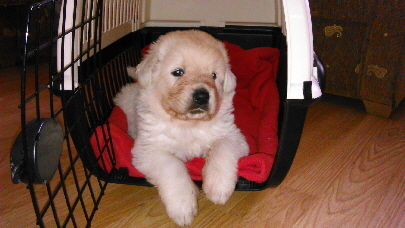 Through her blog, Beata kept us well informed as these puppies grew and were sold to new owners in many countries. One even went to the American state of Idaho, and Joyce feels remiss in not being able to teach American English to this puppy. Click on the picture, above, of Kama and a baby, to view Beata’s blog. On May 23, 2015, Kama delivered her 6th litter, consisting of only one puppy. His name is Orest, and he will live in Gdansk. Since he is the only puppy, Kama is able to care for him very well, and it is easy to see that he is prospering from a liberal diet.